Enjoy the peaceful country setting of this home on 2 acres being offered with adjoining 5 acre parcel. Property is fenced for horses with 1 minter's inch irrigation water, pond & domestic well(2). You'll spend countless hours enjoying all aspects of this property which is viewed from the spacious deck and large patio area. Equestrians will appreciate the hay storage area, tack area and easy driveway access for large rigs. 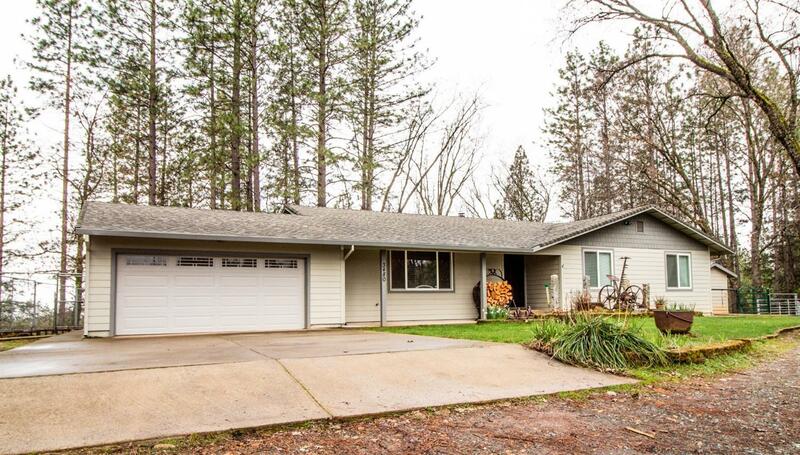 Move in ready, this attractive ranch style home boasts a large country style kitchen with ample counter space, dining areas and cozy wood burning stove. Easy access to utility room with bath, pantry, formal dining area and outdoor living space patio and deck! Energy efficient dual pane windows and newer central HVAC system. The creative person in the family will have separate space for their hobbies, tasks and storage in the detached shop with covered front access/patio area to call their own. Situated with nearness to many recreational trails and close to town needs.